Cut tuna into long, thick pieces about 3cm in diameter. Keep chilled until ready to sear. Add macadamia nuts to a warm frying pan over a medium heat, toss and toast until golden. Set nuts aside. In a small bowl combine lemon juice, soy sauce, ginger and sesame oil. Wash the spring onions well in water and squeeze to release the sticky onion juices. ​Turn frying pan up to a high heat and add a drizzle of extra virgin olive oil. Sear the tuna for 30 seconds on each side. Leave to rest for a few minutes before slicing into thick pieces. 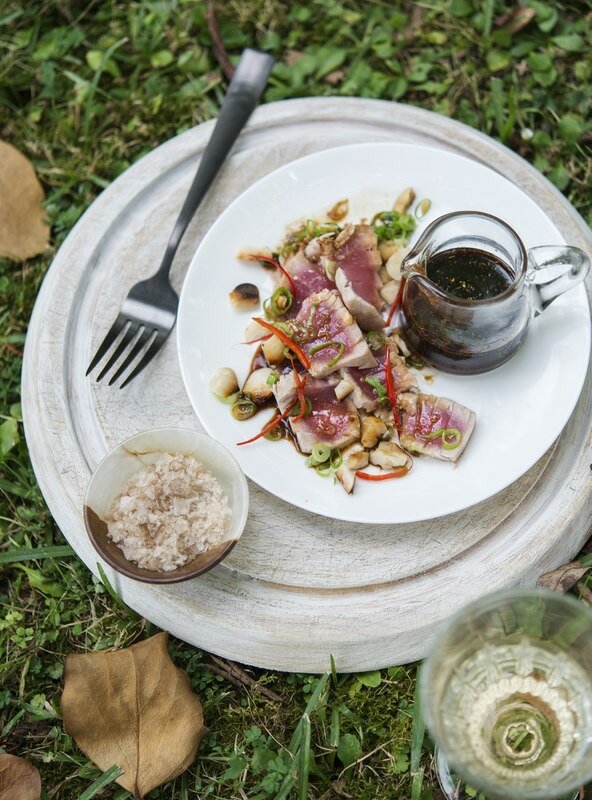 Layer tuna onto plates and sprinkle with toasted macadamias, spring onion and fine lengths of red chilli. Drizzle with the tataki sauce and serve. ​​Tip: Tataki is a traditional Japanese method of searing tuna or meat over a high heat, then slicing and infusing with a pounded ginger-flavoured ponzu sauce (a basic sauce flavoured with citrus, such as yuzu or lemon, to serve in the sashimi style).